– Where ancient Khmer motifs infuse contemporary design. Believe it or not, I’ve lived in Bangkok for years and had never been to Cambodia, even though it’s just across the border. Maybe it’s the close proximity, but it never seemed so urgent a destination. The only reason to visit would be to see Angkor Wat, but, hey, those ruins have been there for a thousand years so it’s not like they are going anywhere. So I finally, finally got to the country next door about a month ago. I love archeological sites. I even wanted to be an archeologist when I was a kid, the way little kids want to be astronauts and vets when they grow up, because that’s what they think is glamourous and fun. I was reading lots of National Geographic when I was a kid. (That changed when I took an Archeology 101 class in college and found out it was not at all what it looked like in National Geographic magazine). So of course I’ve always wanted to visit Angkor Wat, but never got around to it. Whenever my friends went, I wasn’t able to join them for some reason, and eventually they had all been there, which left me with no one to go with. And in recent years it’s become famously overrun by hordes of loud Chinese tourists swarming over the ruins, which doesn’t sound appealing at all. Then recently my old friends from UK were visiting Bangkok and asked me where to stay in Siem Reap. “I‘ve never been there”, I told her. “Well why don’t you come with us!” she said. Here was my big chance to go with some fun people! So a few weeks later there we were, comfortably ensconced in the hotel I’d always wanted to visit in Siem Reap. The entrance façade to the Shinta Mani Angkor Hotel. I’d heard of Shinta Mani Angkor Hotel and its Shinta Mani Foundation when it first opened in 2004. Formerly called the Shinta Mani Club and recently rebranded as Shinta Mani Angkor, it was one of Siem Reap’s earliest boutique hotels and had garnered lots of attention thanks to its design by American designer Bill Bensley, one of Asia’s most famous and in-demand resort and spa designers. As can be expected from any hotel designed by Bill Bensley, Shinta Mani Angkor was completely chic and luxurious in its design, comfort, and service. I was intrigued by its subtle elegance as soon as I stepped inside and found that the longer I stayed there, the more comfortable and at home I felt there. I was only there for two nights and three days, most of which was a mad rush between hotel and ancient temples to be in the right place at the right time. But by the time I left, I loved the place and felt right at home, probably due to the small scale, cozy interiors, and warm service from all the staff. The main building housing the reception and main lobby was renovated from an existing old colonial house, and you can still feel that homey historic building vibe in the building’s old bones when you walk through the lobby and front entrance. My spacious and comfortable deluxe room comes with a big balcony. My deluxe room was spacious, cool, and contemporary chic (just the way I like it), with design elements that translate the art and architectural motifs of the Angkor temples on walls and ceilings. I loved my beautiful and delicious gourmet turn-down snack. A different cake appeared by my bedside each evening. My only regret is that I didn’t get to spend more time sleeping in the very comfortable bed since I was exhausted and we had to get up early every morning to start our day, including the day I arrived when I had gotten a much dreaded early morning flight from Bangkok. Waking up before dawn to catch early flights is an absolute horror for me, and I dread them, getting fraught with total anxiety for days before the flight. Rising before the crack of dawn is de rigeur for visitors to Angkor Wat who want to catch the temples at sunrise, which is one of the most exquisite, poetic views you can see here. Most visitors do, but no one in our group could get up that early since we were all too tired, for various reasons (jet lagged / exhausted / feeling old / just wanna get more sleep). The hotel’s colourful and very inviting healthy breakfast buffet made it easier for me to get up and start the boiling hot day to come. A healthy la carte breakfast of yoghurt plate, smoked salmon plate, plus cold cuts, cheese and salad from the buffet, fresh juice and latte. Aside from wanting to get some decent and comfortable sleep, we didn’t get out that fast in the morning because we really enjoyed the breakfast here (included in the room rate). I love these healthy energy tonics to start the day. Breakfast is best enjoyed sitting on the outdoor terrace and browsing the beautiful and inviting air-conditioned buffet which was filled with healthy options. No bacon or sausages here. We made it to the ruins by 8.30 a.m., feeling cheerful, fresh and excited when we left the hotel in a jaunty tuk tuk, but by 10 a.m. we were already parched, burning hot, sweating and totally depleted from the relentless sun and scorching heat. Buddhist monks at Angkor Wat feel the heat too. Photo by Luke Yeung. Archeology 101. 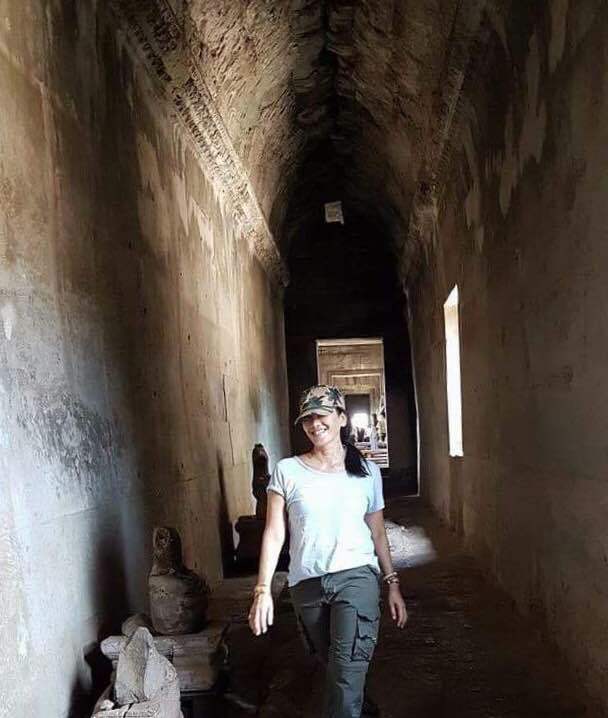 Here I am exploring the endless corridors of Angkor Wat. I love the serene magnificence of this incredible temple site. Photo by Luke Yeung. I’d been dreading the heat, knowing that we were visiting the hot stone ruins at the height of hot season. And, horribly, it was every bit as hot as I’d expected. The temples were still absolutely magnificent and awe-inspiring, despite the heat. As soon as we finished the temple tour, we fled back to Shinta Mani Angkor where the others headed straight to the pool to cool off. Stones used in the hot stone massage at Shinta Mani Angkor spa. I headed to the spa for a soothing hot stone massage. I know it sounds ironic to be having a hot stone massage after being grilled alive among the boiling hot stones of Angkor Wat, but it’s not the same! Hot stone massage is the most effective muscle relaxing spa treatment I know, and is great for soothing a stiff, aching, back and neck. Sunset at the ruins. Photo by Luke Yeung. When the scorching midday heat wore off, we managed to get in some sunset trips to the ruins, which were probably not as dramatic as the sunrises but lovely all the same. it was relaxing to climb up to the top of an ancient monument and sit on top watching the sunset’s golden glow sink into the tree tops below. Back at Shinta Mani Angkor, we spent a lot of time hanging out in the restaurant, where the outdoor terrace with giant swings provided wonderful places to linger over meals or just relax and chat. Dinner was the six course chef tastes menu of contemporary Cambodian cuisine which was beautifully presented in the nice, cool, air-conditioned interior of the Kroya restaurant. By the end of my short stay, I loved this charming hotel so much and felt right at home here. If you’re thinking of staying here, take note that there are two Shinta Mani properties, Shinta Mani Angkor and Shinta Mani Shack (formerly called Shinta Mani Resort and not shack-like at all), located next to each other and each a bit different from each other. Luscious flowers and fruit await inside the guest rooms at Shinta Mani Shack. See, I told you. Not shack-like at all. Shinta Mani Angkor was established first, and is a small, intimate hotel with only 39 rooms. Shinta Mani Shack is a sister property and was established in 2013 when it was renovated from what was originally another larger hotel next door. Fresh lotuses ready to be folded and arranged. You can take flower arrangement classes to learn how to fold fresh lotus buds into these lovely floral creations that decorate the hotel. With its bigger size and 62 rooms, Shinta Mani Shack tends to cater to larger groups, while I prefer the smaller Shinta Mani Angkor. Exquisitely folded lotus floral arrangements adorn the lobby at Shinta Mani Angkor. I also found out that the hotel’s location was perfect for visitors to Seam Riep. Located in the tree-lined, leafy Old French Quarter, on the same road as the Royal Gardens, Shinta Mani Club is easy walking distance or short tuk tuk ride to the raucous, blaring night market, is just around the corner from Siem Reap’s popular upscale social hub the lovely FCC hotel / restaurant / bar., and a 5-minute ride to the not-to-be missed Angkor National Museum, filled with spectacular Khmer sculptures and ancient treasures. All of it makes for a most comfortable, convenient visit to Angkor Wat. The only element lacking was more time to see more temples and explore more around the area. But hey, Angkor’s miles and miles temples have been there for centuries and aren’t going anywhere. And archeologists are still discovering more sites that were previously unknown. There’s plenty to see and do for another visit! Have you been to Angkor Wat? Was your experience as hot as mine? Love this review – I have to admit though I also dread early morning flights – I still haven’t found a way to make them easy on my system, unfortunately its just a necessary hardship for global travelers I think.. Thanks Emer! I’m glad to hear I’m not the only one who dreads early morning flights! I always feel like a total wreck and anxious that I’ve forgotten something when I’m scrambling to catch a dawn flight! I don’t know how other people do it!